After several months, and several distractions demanding attention, I've completed the revision of my book, "Caution: Mermaid Crossing". My editor told me to think of the undertaking as if it were a master class... one that will work my brain overtime. By far, it's the hardest work I've ever done and pushed to use a very different part of my brain. I'd liken it to pieces of a puzzle floating in the Universe that is within hand's reach but just how to grab the right piece and fit it all together so it becomes a captivating whole is the true challenge. Many thoughts and emotions swirled around both as powerful waves and calm ripples. I had to go deeper, deeper than I was comfortable doing. My editor encouraged me to dive into those canyons of painful valleys and poetic peaks. Knowing that I have the right editor, who I respect for her keen insight and understanding of my voice, is the very reason I don't want to disappoint with my hard won efforts. Diving deep into canyons is both exhausting and enlightening. I know that I'm changed--forever changed from critical challenges and experiences. I continue to work at not only fully grasping a path through cancer and an interesting variety of hard hurdles but healing from physical and emotional repercussions. I can't risk further judgment I've received out in the world while going through a health crisis until I feel more fierce, so it's easy to isolate and retreat. Solace is necessary for writing. Sans family, I'm very content with my close posse of sparkling angel friends (mostly far away) and our mutual support is a gift from the gods. I find that writing is for those who can be secure alone and even enjoy being in one's own company. Seeking a ritual to inspire my creative flow is how I made it to the end of a revision. It's a practice I've come to cherish. My revised ritual (one I continue as a writer and healthy New Year regime) for accomplishing the task of a successful and timely book revision instead of it taking an endless cycle of seasons goes as follows: getting to bed early, waking before the sun comes up, and getting my tea in the dark. When weather permits, I sit out on my patio in a chaise, sip tea, watch light paint the sky in different hues while the day peeks through as I listen to and feel my hummingbirds. The quiet envelops me and feel as if I'm holding a secret reverie being up before anyone else. When the sun continues its rise where light is greater than dark, I read. When an hour passes, I eat breakfast, pull out my lap desk and laptop, plop myself on the sofa with back support and began writing essay by essay from the beginning; one-by-one paper clipping each essay that's been re-written for the discovery of a desired end. I think about the idea of paper clipping arduous and heartbreaking episodes in my life and handing them over to more capable hands to bless, analyze, solve, and then sent to a special place in the heavens for filing and safe keeping--Absolute healing and magic takes over and the cautionary brutalities of life push further and further into the vast Universe dissolving from blazing heat of a star. Once I emailed the revision, I felt my body move into a foggy fatigue. Cathartic indeed. While I know the revision has brought the book to a closer final draft, I worry it's still not quite there. Will it ever be there and will the editing ever end? Will the revision on myself ever end? I believe the edit will eventually come to an end but self-revision is ongoing. 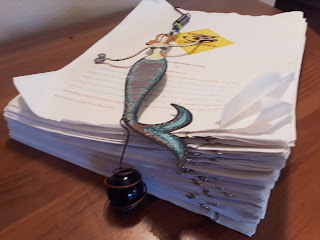 At some point, I'll have to announce that there's a final draft, but revising myself after enduring a marathon of trauma, and losing years to cancer that can't possibly be given back to me will be tricky. This is the moment in life (at an age I don't care to admit) to fully realize that I can only live in-the-moment because nothing is sure and plans I felt were critical to happily thrive in the world didn't find their way into manifestation. Revising old dreams, recreating new visions, reinventing where I am now, reinforce my activism for progressive action on critical issues and protection of a fragile planet and wildlife, share my truth; as well as renewing my mermaid spirit and tender heart is my intention for 2019. What's yours? Happy New Year--May it bring you magic! Congratulations on getting so much hard work done. I remember how much work it was to write, edit and publish my first book. I'm almost finished with the first draft of my next book - then I'll be doing revisions like you're in the midst of. Cheering you on in your process - you can do it! "While I know the revision has brought the book to a closer final draft, I worry it's still not quite there. Will it ever be there and will the editing ever end?" I can absolutely relate to this! I imagine seconds before clicking "publish" on Amazon, I'll be going in and making revisions!